Jorge Oteiza modern art museum in Spain. By the way, some months ago I wrote about another jewel: a top quality modern art museum in Spain not to miss: the Museum of abstract art in Cuenca. As I was saying, Jorge Oteiza´s modern sculpture museum is a MUST if you are a contemporary art lover. 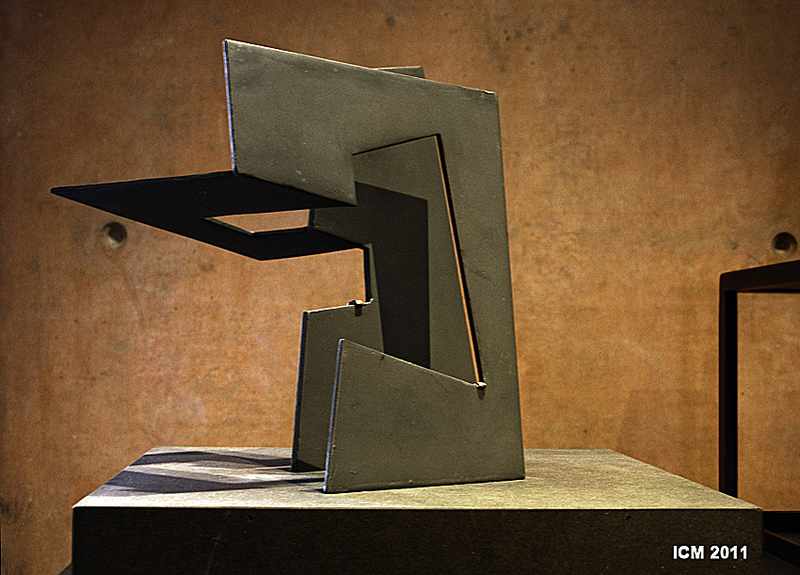 Considered one of the most influential XXth century sculptors, Jorge Oteiza was more than that. He was a sublime and deep abstract artists whose studious´ life could perfectly be compared to that of Leonardo Davinci´s. Oteiza´s modern art museum was specially build by his friend the architect Sáenz de Oiza to integrate the artists´creations with the building. 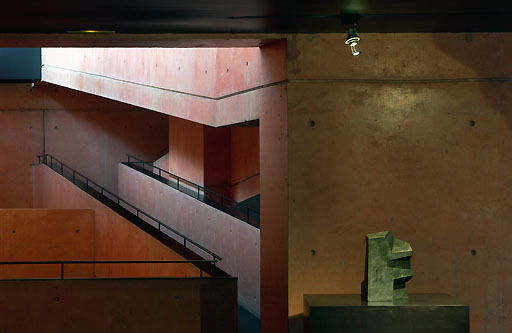 As you can see in this article´s photos, the resulting symbiotic integration was perfect, a charateristic that makes this art museum a mystical unique place. I had never ever seen so perfect integration (and I´ve visited many world museums). Light, walls, shadows, forms, corners, furniture style and layout incredibly interact and fusion with Oteiza´s figuratives and abstract sculptures . Oteiza´s most influential abstract sculptures (those from the 1950´s decade) deal with geometry, space, matter and emptiness. He deeply and seriously reflected about the above themes, and as Gonzalez Pedemonte says is his blog “he pretended to hollow his sculptures of matter so that they would essencially contain pure space. For him, space was the most genuine art expression, a perfection that got close to the sacret and that no other matter could equate”. Otieza´s called his 1950´s abstract process “desocupaciones”, whose main objective was the emptiness that shows up when shape (space´s bundle) is decomposed. After developing this emptiness concept for almost a decade, and while being at the most successful moment of his artistic career, Oteiza stop investigating (he even said that contemporary art was finished) and “quit being a sculptor”. For this strict modern artist there was a big difference between being a sculptor (the artist that investigates) and sculpting (the process of mass making and “repeating” sculptures). The influece and power of Jorge Oteiza´s creations can not be summarized in a blog post. Should you want to investigate this sculpting master a bit further, I really recommend you to make an effort (if you travel from outside Spain) and visit his museum. I asure you will not regret!! What other unique contemporary or abstract museums would you recommend to yasoypintor readers?. What do you think about Oteiza´s differentiation between being a sculptor and sculpting?. Feel free to add your thoughts below, and remember you can be updated of future posts either by subscribing to this blog or by joining yasoypintor on facebook or me Antonio Basso on google + . 14 Responses to "Top modern art museums: Jorge Oteiza´s modern sculpture"
I like that very much, the difference between ‘being a sculptor’ and ‘sculpting’. The more I think about it, the more profound it becomes. Interesting stuff (and fantastic works). 100% agree with you Glennie. I visited the museum not long ago and I found the building and the artworks, a masterpiece. Beautiful post, Antonio. Congrats. Hello Germán, thanks a lot for sharing your personal experience here. It really is a masterpiece. Regards and take care. La primera vez que visité el museo quedé sobrecogido. Me pasé tres horas con los pelos de punta ante semejante unión de escultura y arquitectura, ambas geniales. Es probablemente uno de los mejores ejemplos de entendimiento entre artista y arquitecto y una de las mejores obras de Sáenz de Oiza. Hola Ignacio, bien venido de nuevo. A mí me pasó algo muy parecido a tí. Tenía muchas ganas de ir, pero la experiencia superó ampliamente mis expectativas. Es una verdadera de joya y como tu dices “uno de los mejores ejemplos de entendimiento entre artista y arquitecto”. I agree with you Antonio, visit Jorge Oteiza’s museum is a must for those who like modern art and its fusion with the architecture. When I visited the museum I got surprised by the concept of emptiness of its artworks. Hello Carlos, thanks to you for adding your personal experience here. I know I will go back soon. I was so impressed with what I see that the visit went by too fast. Regards and see you around here soon. I’ve never been at the Museum but I’ve really enjoyed the pictures and explanation!! If i go to Pamplona I will visit it. Thanks for sharing! Nice post! I´m happy to read that so many people are interested in our Musem. As Antonio says, for Oteiza the art was a way of investigating. 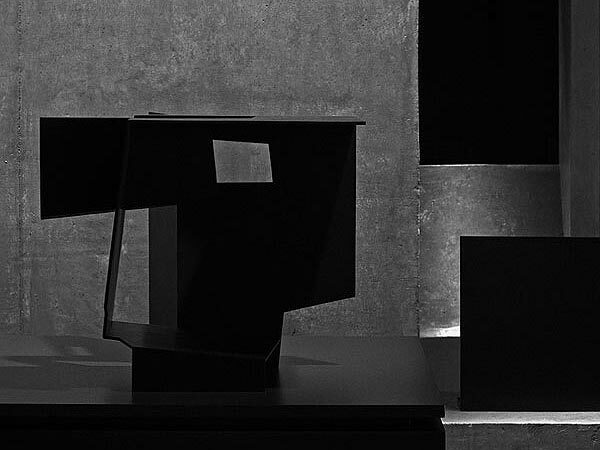 His objective was not creating objects but the reflection about the relationship between sculpture (mass) and the emptyness. The procedures of the “experimental series” promotes the “repetition” of the sculptural concept, with abundant solutions, the grouping of which precisely manages to manifest what is beyond the representation of ideas and which only the technique of art dares to show. By the way, today is his aniversary. He would be 104!! thanks a lot for sharing your valuable comments here. I´m sure many yasoypintor readers will appreciate and enjoy them.